I was so happy that I'd finished my first top for the Month of Tops hosted by Faye @ Faye's Sewing Adventure that I couldn't see the clouds for the sun. However, when I woke up this morning the clouds made me realize that what I thought would be satisfactory wasn't so. I used New Look 6407 with a poly/cotton fabric in soft blue and tweaked the pattern sleeves for french cuffs. The pattern called for bracelet sleeves, I wanted long sleeves and extended the sleeves 3" and also lengthened the sleeve band. Some where along the line I lost sight of what I was doing and my cuff opening was in the wrong direction. I initially thought I would be satisfied with them, but ummm nerp...lol At 7:30 am I took on the task of removing the cuffs from the sleeves and positioning it correctly. Ahhh, I feel so much better... it was a tedious task, but in the end I am very happy. Matter of fact I'm going back to the men's boutique shop that I'd purchased the cufflinks from, the sales clerk showed me a lovely cufflink set with a light blue stone and thinking it would look better than the onyx ones I purchased. New Look 6407: Misses Blouse with collar, sleeve and cuff variations. The blouse went together effortlessly. I serged all the seams and did a straight stitch to keep the serged edges flat. At some point I thought I would take flight, the collar on this blouse is definitely boeing 747 potential....lol. All in all the blouse is a great addition to any wardrobe. 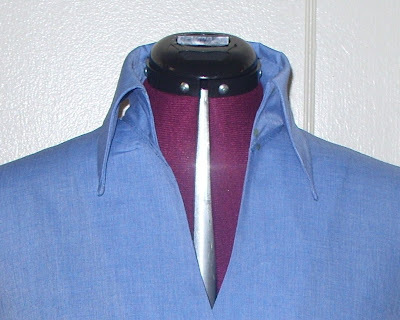 I would love to do another one and hope to be able to tweak the collar for less flair. Beautiful - simply beautiful! And I'm loving the cufflinks! A beautiful blouse and the collar is a very nice detail. It must in every wardrobe ;-)! Very pretty! Great fit and color on you. I'm impressed that you made a collared shirt. They are so intimidating to me. Great cuffs! Really nice look. The colors look nice on you too. Fab post!! Love it. I don't think the flare on the collar is too much but that just might be the 70's in me talking lol. Great color on you and I have a leaf blower for those leaves. I totally understand your need to redo the cuffs. I'm sure you like it much better! Beautiful shirt and cufflinks. Love this, and I love that collar too! Nice, and cufflinks are a fabulous idea! Who says guys should have all the fun with those? I agree the blouse is great. I like the cuff links. Hard to say from a photo, but it doesn't look like it needs tweaking. Great work. I adore this color and style on you, Sheila! You created such a fine shirt with lovely details! WOW! Such beautiful details! great work on this top! Wow Sheila! If I didn't know better, I'd say you got that OTR! Very nice job. You look very smart in it also. What a smart looking top. Fabulous!